At least 34 people have been confirmed dead and hundreds are missing Saturday after a dam burst a day earlier at a Brazilian iron mine, according to the local fire department. 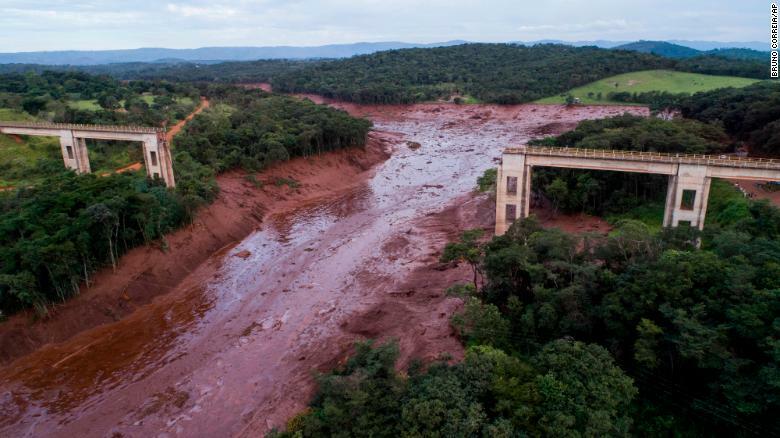 The dam’s breach flooded parts of the southeastern state of Minas Gerais with mining debris and mud, which covered the city of Brumadinho, according to footage from CNN affiliate Record TV. State Gov. Romeu Zema on Saturday declared three days of mourning, according to a release from the government of Minas Gerais. He also thanked all agencies who have come to help during the catastrophe. Video from the scene showed helicopters hovering feet above the ground as firefighters plucked people from the muck and carried them away. An aerial view shows a collapsed bridge after flooding from a dam collapse Friday in southeast Brazil. The latest death toll comes from the Minas Gerais Fire Department, which is conducting search and rescue operations. Of the 34 confirmed dead, the fire department said 22 bodies have been recovered. Search efforts stopped Saturday at 8 p.m., the fire department said, and will resume Sunday at 4 a.m. The reason for this, the department said, is because of the increased flow of one of the dams being drained to lesson the risk of another possible burst. Also, heavy rains were a problem for rescue aircraft. The department said it understands the possibility of finding people alive decreases as the hours pass, and it will continue the search until all victims are found. The civil defense agency and the fire department confirmed 366 people were found and 256 are missing. The fire department also said 23 people are in the hospital and four have been discharged. Vale, the Brazilian mining giant that manages the Feijao mine, has updated a list online with 251 names of people they have not been able to contact. The state judiciary also froze more than $260 million from Vale, with a presiding judge citing the company’s responsibility for the disaster. The money will be deposited into a judicial account to compensate for any costs to the state as a result of rescue operations or victim support. Minas Gerais state has fined Vale $99 million for damage caused by the dam break and said the money will be used for repairs. Minister Augusto Heleno, from the Institutional Security Cabinet, and Attorney General André Mendonça held a press conference Saturday to discuss the dam break. Heleno said both municipal and state governments are fully capable of providing assistance during this emergency period. Heleno confirmed financial aid will be given both directly to the population and the local governments, but he did not elaborate on exact amounts or how funds will be distributed. Officials said during the press conference the dam that broke was not classified as high-risk. Mendonça said Vale is responsible for the disaster, but the extent of the damage is unknown. It was made clear during the press conference that the priority now is assisting victims and their families. After that, officials said they’d focus on environmental damage and the mining process. In an effort to find missing people, the Federal Attorney General’s Office obtained an injunction in the Federal Court of Minas Gerais ruling that mobile carriers should provide data from the cell phone signals of people who were in the region where the dam broke. Brazilian President Jair Bolsonaro flew over the scene Saturday morning and met with Minas Gerais Gov. Romeu Zema before returning to the capital. “It is hard to witness this whole scenario and not be emotional,” Bolsonaro tweeted Saturday. 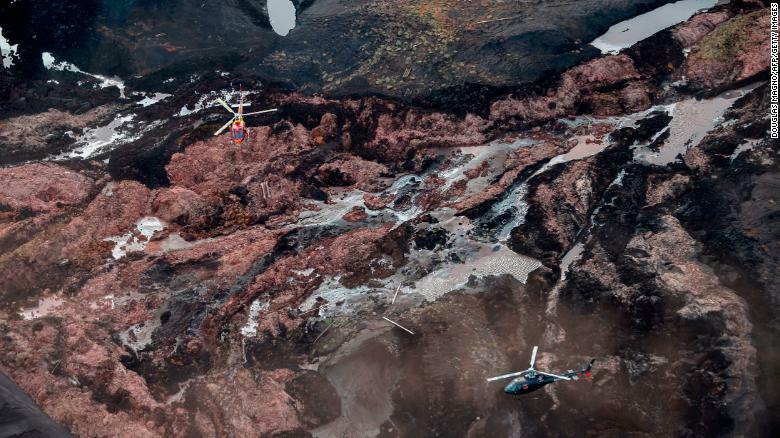 “We will do everything in our reach to help the victims, minimize damage, investigate the facts, claim justice and prevent new tragedies like the ones in Mariana and Brumadinho for the well-being of Brazilians and the environment,” he said, referring to a similar mining disaster in 2015. The aftermath of the dam collapse near Brumadinho in southeastern Brazil. A “breach” Friday caused mining debris to spill into the mine’s administrative area, where employees were working, according to Vale. Authorities said Friday that 427 people had been in the iron mine when the dam burst. Karolainy Stefany de Jesus, 21, lives close to the area affected by the dam burst. She got a call from her uncle, who works at Vale, and ran to the affected area to see if she could find relatives. She told CNN on Saturday that all she found was a scene of despair. “It is devastating, everyone here at the community is in shock, nobody expected that to happen,” de Jesus said. Officials expect to contain the mudlike mine waste, called “tailings,” within two days, according to the Brazilian National Water Agency. That’s how long it’s due for the muck to reach the Retiro Baixo hydroelectric dam, 220 kilometers (135 miles) away, the agency said. Water agency officials are “monitoring the mine tailings” and “coordinating actions” to supply quality water to the affected region, it said. 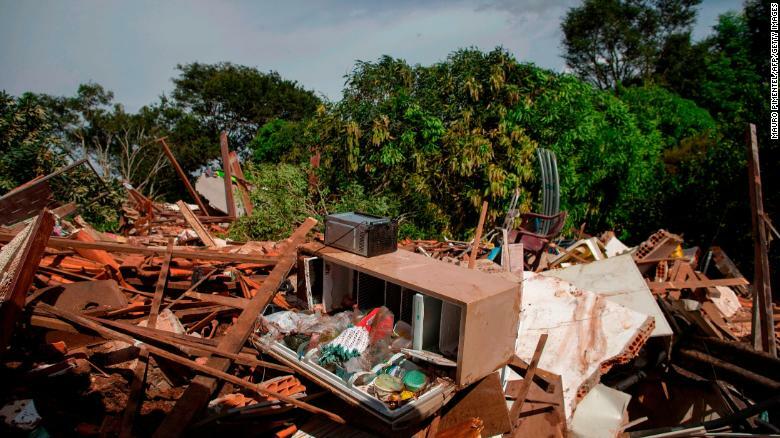 Debris is widespread Saturday in the Parque da Cachoeira community after the dam collapse. “Unfortunately, the dam break (today) happened. This is inexcusable,” Schvartsman said, adding that Vale will “do all possible” to aid victims. “What just happened just now is beyond anything that I could imagine,” he said. He also said the company had put “immense effort” into improving its dams, especially after the mining disaster in Mariana. Vale says it has provided more than 1 million liters of drinking water to the people affected by the dam break. The company also says it has provided accommodations for more than 800 people, along with 40 ambulances and a rescue helicopter. Employees were working with volunteers to rescue and identify victims, the company said. 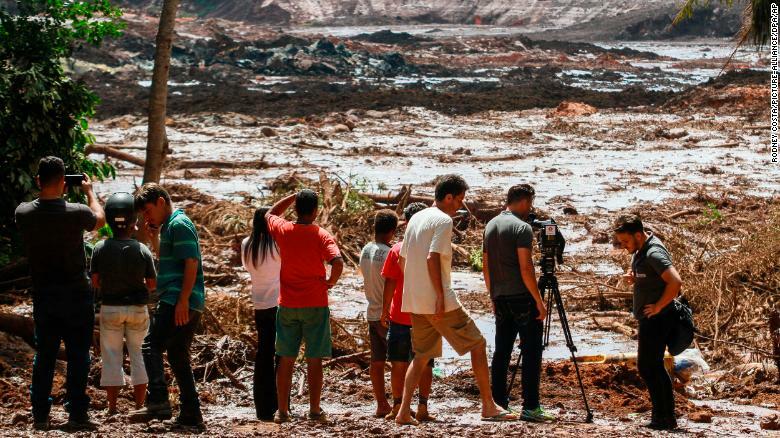 People observe the mud masses Friday after the break of the dam at the Feijao mine. The UN System in Brazil also offered support, expressing its “deep sorrow and solidarity to the families” of the victims. “The UN regrets the immeasurable loss of lives and significant damage to the environment and human settlements,” a statement said. “The UN System is available to support the actions of the Brazilian authorities in the rapid removal of the victims and in the establishment of dignified conditions for the eventual homeless and the affected population.